Amber Opera Choker Beaded Necklace. Faceted Amber Minimalist Collar Necklace. This is a truly unique opera necklace made of 54 rare faceted amber beads of different colours. It is made of three strands of different lengths, the shortest is 43 cm and the lower drop is about 50 cm. Style: ChokerBrand: HandmadeLength: 16 - 17.99"
Sterling Silver choker made with Genuine Swarovski® Crystals. Height : 1.1cm. Metal: Sterling SilverStyle: ChokerLength: 16 - 17.99"
Mookite Lovers -a QVC Mookite Puffy Heart. Mookite Lovers -a QVC Mookite Puffy Heart which is so soft and tactile. Condition is Used but not worn often as felt claustrophobic in it. Perhaps you have a smaller neck or can replace leather to make it longer. 925 silver bail and clasp . Heart on three stranded leather. Dispatched with Royal Mail 2nd Class. 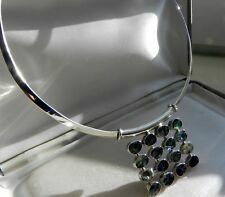 Sterling Silver Choker made with Genuine Swarovski® Crystal. Width : 1cm (Crystal). This gorgeous 925 stamped sterling silver choker collar necklace comprises a reasonably flexible choker, the inner circumference of which is 15.75" long (including the gap of 1.75") by 4 mm. As well as being stamped 925, it is also fully hallmarked. This necklace is Perfect to wear on its own for a minimalist look or in combination with my other Chakra beaded necklaces, Silver Hamsa necklace, beaded Chakra bracelets and beaded chakra rings. 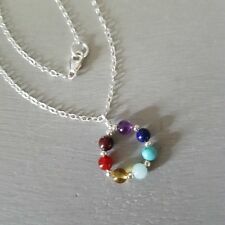 Tiny handmade designer Chakra gemstone bead necklace. 42.20ct Moonstone and 9ct Yellow Gold Necklace - Antique Circa 1900. However, the star of the show is clearly the free-form star spangled whisky amber nugget pendant! It is stamped 925 on the back of the bail. DELICATE PINK CORAL BEAD/FRESH WATER PEARL CHOKER NECKLACE. The purity of the gold must be of at least 10 karats. This is a beautiful one-of-a-kind necklace and earrings set. Handmade by a local (North-West England) jeweller, it comprises a 52.5 cm (44 cm plus 8.5 cm extension) necklace and a matching pair of drop earrings. Diamond cut cable chain choker necklace with extension chain. Sterling Silver 925. Chain Length: 16". Rare Exquisite Natural Amythist Beads & Gold Link Ladies Choker Necklace 16.5"
Here for sale we have a beautifu 925 Sterling Silver necklace with swirl design and mauve oval stones to decrorate. They are all in good condition, as is the silver. The width of the choker tapers from 5 mm to 9 mm, and it weighs a hefty 32 grams on its own. End to end, the length is 16.5", the width is 22 mm (at its widest) and the depth 7 mm. This exquisite butterfly pendant is made with pink sapphires and diamonds in white gold. A gift that's sure to elicit delight from its lucky recipient. Set with natural pink sapphire and premium diamonds. Beautiful Light Aquamarine and Jadeite Beaded Choker Necklace. With Jadeite Spacer Beads. 3 x 2mm Aquamarine Nugget Shape Beads. I only use Genuine and Ethically Sourced Gemstones and Pearls. The seed beads I use are genuine Miyuki glass beads from Japan. Stamped BA 925 on the back, it is also fully hallmarked on the end soldered ring. Simple, stylish and sophisticated is this ladies necklace. Set with freshwater pearl for the perfect look. With freshwater cultured pearl. 925 hallmarked. This positively celestial 925 stamped sterling silver choker collar necklace certainly has STAR quality! The total length of the necklace (ie including the drop/length of the pendant) is 17". The inclusions are bright and plentiful, and I would describe the colour as golden ochre yellow. Stunning silver fine necklace. The piece has lots of style. This piece is Hallmarked 925. Sold as seen in the images. Stunning Fine Silver. We chose not to clean our pieces. About This Piece. Weight must be no more that 200g, otherwise the cost will be higher. Flower necklace Designed and Handmade by Artisan Silversmith. Approx weight of necklace 21.68 g.
Stunning Sterling Silver Chain. Heavy 925 silver chain necklace. The piece is marked as 925 sterling silver. Sold as seen in the images. We chose not to clean our pieces. About This Piece. Weight (approx). A seriously gorgeous 925 stamped sterling silver choker collar pearl necklace from Arezzo, Italy weighing a hefty 72 grams! The natural, irregular, pearls are mainly of the "potato" shaped variety, and these are interspersed now and again with gold washed silver beads. Set with natural pink sapphire and premium diamonds. This beautiful FOREVER necklace is made with pristine white gold and beautiful pink gemstone detail. Made at the London Jewellery Quarter. Length of necklace 16 - 18". We will respond within 24-48 hours, in most cases sooner. length: 17-19". Set with natural pink sapphire and premium diamonds. This romantic and trendy white gold necklace from our premium collection features two sparkly little hearts - one studded with diamonds and the other with pink sapphires. Stunning 925 silver chain necklace. The piece is marked as 925 sterling silver. Stunning Sterling Silver Chain. Sold as seen in the images. We chose not to clean our pieces. About This Piece. Rest of World. Made in Italy. Weight: 55g. Length: 17". We will respond within 24-48 hours, in most cases sooner. We will respond within 24-48 hours, in most cases sooner. length: 17-24". New 3 rows Natural Pink Crazy Lace Agate Statement Necklace 17-19"
Length: 17". We will respond within 24-48 hours, in most cases sooner. size(Approx). This is a STERLING SILVER Necklace with a Star and. with a secure s hook. It can stain the jewelry badly and need cleaning more often, especially sterling silver. Each Leaf on Necklace and Earring Set with Three Rectangular Peridot Baguettes.925 Sterling Silver (Stamped). Big Rare Natural Garnet Etruscan Byzantine Style 925 Sterling Silver 22K Gold Plated Greek Handmade Art Necklace. Select the Greek Jewelry if You Want A Jewelry Stand Out And Be Original. The Necklace is 100% Handmade Work And Produce On Greece From Small Family Laboratory With Over 100 Years Tradition & Experience on Silver Jewellery.